I wanted to take some profits today on a couple stocks I would normally let ride. These were RIMM and AAPL. I have 2 trades for each going on these, so that's fine. My CMI contingency to the upside got triggered, as well as my LEH got its protective stop triggered. The LEH was a break even trade. CMI, RIMM, and AAPL were both basically 1 day trades (profits taken in about a 24-hr time period) and I'm very happy with the returns. 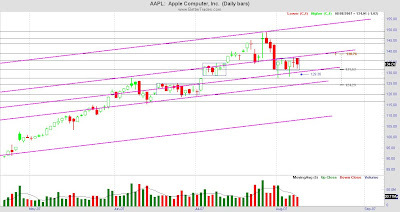 Of course, it did help with the market gapping up, as well as AAPL and RIMM gapping up. 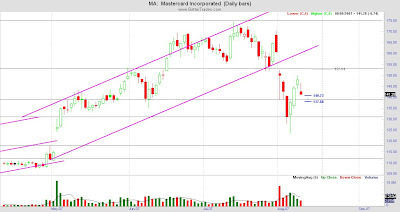 CMI did a great job just being very bullish today, minus at the end, so this may look like a nice bearish trade for Tues, though, I will rebracket and let the stock tell me. I used to trade the Qs and one can make decent enough money trading the Qs, but you would have to buy a lot of contracts and that cuts into my profits, that is one of the main reasons why I like to trade higher priced, faster moving stocks. My point in this was look at how beautiful the pattern is. It's absolutely lovely. I would put more charts up, but I need to reboot soon. Too many applications opened at a time. Sigh. One of my friends has been working for Blue Coat and I've been loosely tracking this stock. It's on my B watch list. As I look at their option pricing for Sep/Oct for puts and calls, they seem fairly priced. It's not a heavily traded stock, but the Open Interest for what I would trade, in this case 1 strike ITM or ATM, in this case, Sep80C, would be reasonable. It has the most Open Interest. The past 3 days has been pulling back from a nice run up from $60 to $87. That's almost a 50% increase at just the announcement of a 2:1 stock split to take place Sep 13th. The following week is expiration week. 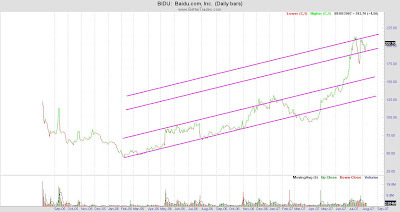 Right now, it looks to be trading into a descending wedge, so maybe a good bracket would be to look for a breakout either to the upside or downside and play that to the split possibly. I do something called bracket trading which allows the stock to tell me which direction it wants to go. Following are orders that I'm placing today, 2 hrs before the close of market. - Downward trend. Possible support @ 131.25. - Did a SWS from Tues.
- To fill gap at 118.50-119.60? These are the positions from the prior set of stocks traded. Since my funded trading and practice trading is the same minus actual funds, I will begin putting my positions down. This would be my trading plan. If I'm sitting at the computer watching things, I may deviate slightly as I may manually adjust things depending on what the market does. 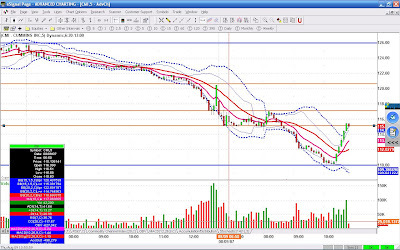 - Cost = -$687.95 (33% cost) - before the market this morning, I changed my stop from 79.25 to 78. Had I gotten out @ 79.25, my costs would've been half of what they actually were. Another lesson learned. Do NOT lower your stops on BULL positions. Adjust UP if you're going to adjust. There was no way I was going to go lower than 78 for my stop and incur more costs. Perhaps I should've just taken the small profits I had yesterday? Notes: Due to volatility being so high when I got in, about $6 of the $19 was due to volatility. 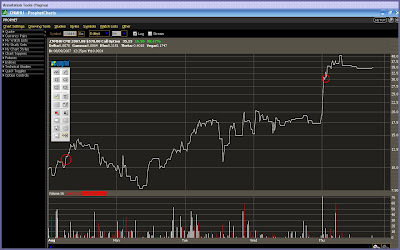 Though the stock has moved up $20 and my option has stayed about the same as the volatility has dropped. In fact, it's cost me some. - Upside Targets are $137.25, $149. - Upside Target 66.50. In a compression pattern (rectangle). If I get stopped out @ $57, I will have a bearish entry @ $56.50, doing a SWS (Switch Stop). - Hard stop @ 141.00 (for 8/28) - the last 6 trading days looks like an equilateral triangle. Moving my stop down some just in case it breaks to the upside. - Downside Targets are 120-124. There is so much information out there and with regards to stocks and options, I have barely scratched the surface. There is something much different now, though. Is it necessary to know all that I want to know, or, is what I do know good enough and continually learn, without going into some great frenzy? As I look at my blog compared to some of the other trading blogs out there, it seems like I'm a very small fish in this vast ocean of knowledge and expertise. My goal is to share what I know about the market and how I use it to make money. As my tendency is to make things so complicated, it causes me to be petrified and unable to move. So, there must be this point that causes one to be able to take action. What I've found that works for me is to really keep things simple. Do I read a ton of news? No. But, I do do some reading. Mainly I focus on charting. Though Tim Knight uses log scale, the arithmatic scale has worked amazingly well for me. I'm consistently making money and keeping my costs down, so I see now reason to fix something that isn't broken. Though I have read the majority of his latest book, it's shared with me how to better use the Prophet charts, which is not what I mainly use for my charting. My preferences are Extreme Charts by Genesis and eSignal. 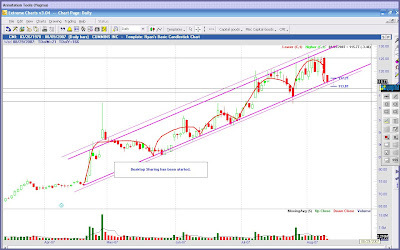 I do love the option charting features of the Prophets from Think or Swim or with BrokersXpress, but the charting maneuverability in Extreme Charts is far easier for how I like to chart. Do what works for you and unless I find that what I'm doing isn't working, I'm just going to stick to it. My life is very complicated right now and so as long as I continually learn and apply what I learn in a way that is sustainable for me and works, then I'll keep doing it. Honestly, I have no clue how Tim or other traders who have dozens of positions on at the same time, do it well. They are the gurus and I am not. So, if you're looking for some complicated explanation about gamma, beta, delta, option pricing, economic reports, blah, blah, blah...that isn't going to be from me. There are plenty of those sites. What I will share are my trades, how I manage my risk, the discipline I need, and basically what I do to make money. For now, I don't have the million dollar trading account, but I will eventually get there. So, one step at a time and let's see where this takes us. I have most of the stuff to the accountant minus a few things which I will gather in the next few days and give all that stuff to him when I get the stuff. So, that is a huge relief and now I can better focus on trading. As for today, Saturday, my son who will be turning 4 yrs old tomorrow, is going to another friend's swim party in an hr with his sister. Afterwards, we are going to a swim potluck going away party for 2 families. That will be a sad occasion, but celebrating with them their new moves out of state. If I'm not too tired, I will be working on stock stuff, looking for more trades. Tomorrow is church, Sean's 4th birthday. One of his aunts & uncles will be taking him and his sister out for his birthday at lunch and then he'll be home so we can go out to celebrate as a family late afternoon/early evening. My trades should be ready by Monday morning. My stops are in place. 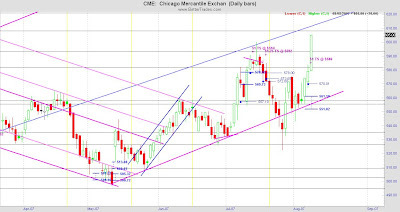 I love trading CME, but you sometimes have to have a strong stomach to take the big moves it has. Setting stops too close can cause you to be taken out too early if you are trading the trend. I like buying strikes 2-3 strikes OTM because of the cost of the options. I like to pay between $4-15 for a contract. Normally I won't want to pay more than $10-11, though. When I buy 2-3 srikes OTM, my target puts my OTM options ITM by the time the stock reaches the target. You need to be able to read the chart properly. This is the stock is the stock I get the greatest ROI cosistently on, but it means to not sit and watch the stock all day long. However, in these highly volatile markets, some daytrading may be in order. What are the pivots for the $SPX? 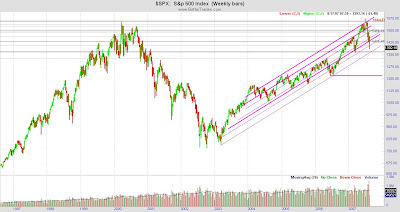 In keeping with the trend it began in Mar'03, 1364 would be a great place for the $SPX to drop to today. Going below that would mean maybe another leg below the current trend is beginning. The thing of concern that throughout the pattern in the last 4.5 yrs, any downward trend has not fallen through this many tiers. Gravity is working here and to stop a fall that goes from the very high to touching the support, well, that can be a challenge. The descent has been much quicker, steeper, so the likelihood of going below this is greater, at least from what I observe of its pattern. The next major pivot point if it drops through 1364 is 1216, probably with pullbacks in between unless there is a huge "fear factor" thing going on. 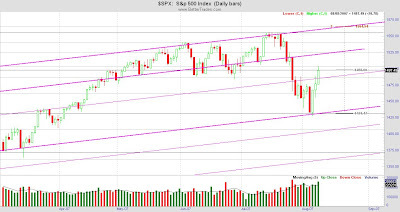 As I look back at the history of the $SPX 1329.50 is also a good point to drop to. What's interesting, which I have not really studied real hard, but in the 2000 - 2003 timeframe of a bearish market, the first drop was around 200 points, 2nd drop was around 300 points, then 370ish point, then 400 points. Then, the final 2 drops, which were more hesistation of the bottoming of the market was 200 points then 160 points. Can you picture this? It gains momentum from 200-300 and though the drops are greater the 2 succeeding, the proportion of it begins to decrease, where the amplitude begins to diminish before the bull market began. What if the $SPX takes on a similar approach to what it did in 2000? It reached its all time highs of 1557ish and dropped those 200 points and sort of stalled, attempting to eek its way back to the 1557ish a few times but ultimately lost the battle and began its descent over the next 2 yrs. The timeframe for ascent to the highs was around 4-5 yrs prior to the "fall". We are right in the midst of the 4-5 yr period of this ascent. The pattern of this is very interesting. The pattern to rise is about double the timeframe to fall. Another interesting point. Gravity (fear). - Buy front month unless it's about 7 trading days before expiration, then I go next month out. - Buy front month unless it's about 5 trading days before expiration, then I go next month out. 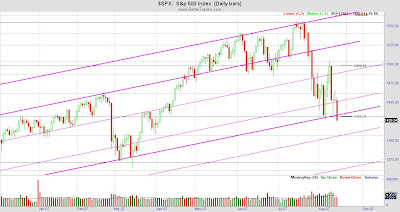 The purple candles represent the $SPX (S&P 500). 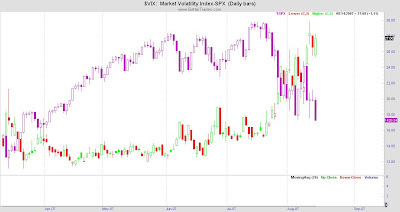 It is curious to me that though today was basically a bearish day that the VIX really didn't change. So, if the market is tanking, the "fear" is not there. Just something that is interesting to note. We've now hit the 1426 to 1433 range now 4 times. We know that's an important area. Will it turn bullish or will it go bearish? I don't know, but looking at the VIX as well as MACD/RSI, it looks like things are poised for a rally, possibly. Commitment of Traders (COT) are still bullish - long. So, if they thought things were really going bearish, they would be shorting, but they are not. Hmmmm...interesting. They could be wrong, which they have in the past with regards to last year when the began shorting and the markets continued to move up. 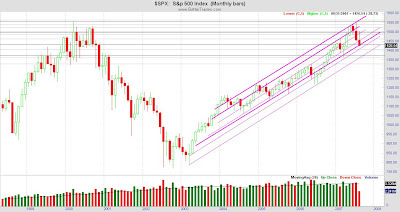 If we change the $SPX to a monthly timeframe, this gives a different picture than the daily charts. There aren't too many months that have more than 3 bearish candles in a row, especially over the past year plus. If a rally takes place, it would make sense. "Easy" is a matter of perception. What I'm learning is that if I truly understand something, it really is quite easy. It's for lack of understanding that things are not "easy". How does someone become a profitable, successful trader - make a living at this? That's really what it boils down to. If you can do those 2 things very successfully, you can make trading phenomenally profitable. How are some ways people do NOT let go of their egos? 1. I just KNOW it's going to do this. 3. It'll come back. I know it will. What does going with the flow mean? Well, if the stock is going up and you're trading directionally, you go with the stock. If it stops going up and going down, you get out of your up position and go down. You manage your risk. No one KNOWS what's going to happen with a stock. I'm finding contingencies to be great, which allows the stock to tell you which direction it wants to take. Set stops based upon how that particular stock trades. Some may require tighter stops, others looser. This is all relative. Sometimes stocks trade patterns, but what if it decides to do something different? Then you do what that different is. There are things I must daily keep in mind with my own trades. Over the weekend, I will be going over the trades I closed this week. Not sure if I will post all of them here, but the ones where I learned some significant things, I'll share. Mon-Thurs were profitable trades and Fri I took costs. I'll share things I did right and incorrectly of both profitable and costing trades. There can be a lot learned from each. This hurt today. For the week, however, I am still profitable. The CMI was accidental. I placed a continengent order that if it got above a certain price that I would be out of it. Typed in the wrong thing and hit send and my position got filled immediately below my contingent, about $2 away. Glad that happened as it's now $1 above it. There are still 2 positions left over from my balloon strangles on AAPL and BIDU, but they are not worth closing as closing would cost me more than the positions are worth. If anything happens to them, great, otherwise, those are just 2 other costs that I already anticipated. I do have one contingent order that has not been filled. That's RIMM below $205.10 to be in for Sep190P. Downside Target = $166 to fill the gap. RIMM usually fills most of its gaps. Indicators (MACD, RSI, Momentum, AMA, and below the 20 EMA) all show bearish. That order is already in place and I have nothing else going on today. It's been one heck of a week and my trading is done for today at 8:30 am (market closes at 1 pm). I'm going to spend some time with my son, go to a yoga class, enjoy my children, and work on IRS paperwork for the remainder of the day. This weekend I will get centered and be ready to trade again on Monday. Glad I decided to have a little patience with CMI. That retracement was just that intraday as it started to head back down. Sometimes it does pay to wait and other times it doesn't. How do you know when? 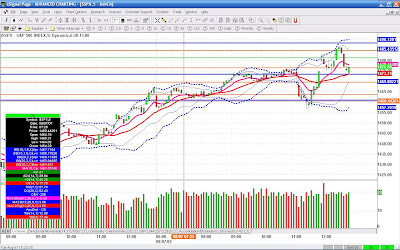 My chart up to the time I updated the daily showed it was at the trend support. The day had not completed yet and it was on it's technically 6th rotation, so the likelihood of that trend ending was fairly high anytime soon. 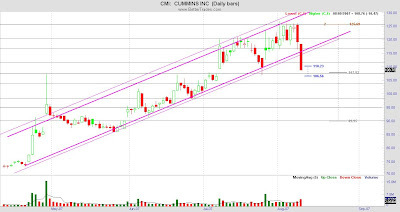 The last couple hrs of the market showed the upward trend had indeed broken and CMI is on its way down. 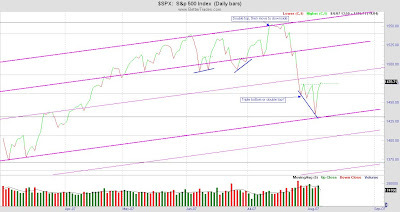 The horizontal support lines are major and minor supports. I won't know until it actually does what it does to know if any of them are supports or not, but I do not that if they should hesitate or reverse at any one of those lines, it would make sense to me. All indicators show bearish. So, the only play right now I have going is for a bearish bracket, with an entry in the $106ish range. I will be Sep105P. GOOG, this as an area to get whipsawed. In the compression pattern, there is a $20 range, which is quite big. One can play this, as you can make some decent money with a $20 move, which I may. How I would do it is if it bounces on the top part of the top bracket coming down, my entry would be the bottom of the top bracket and the inverse is true of the 2nd bracket. Otherwise, my entries for the upside or downside are $524.50 and $497.50, respectively with a $5 hard stop. My son is home with me all day, so this might make trading interesting. AAPL, RIMM, LEH calls - We'll see here, but if either of these head much lower, I'm outta these trades and switching to puts. 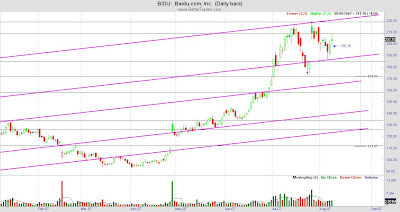 BIDU strangle - just letting this ride out and see what happens. Here was the option pricing for the CME option I had, Aug570C. I didn't get in at the lowest point, nor did I get out at the highest price. I missed about $4 on the entry and about $10 on the exit, meaning I left $1400 on the table. That's another 118% that I left, but that's okay. One of the things was this morning, I did sort of feel anxious. When you do, you need to just take your trade off the table. My target of 607ish and 611 were both correct. But, because it hesitated at 600, that made me quite nervous. What I could've done was put a $0.50 trailing stop on the bid. That probably would've taken me out around 38-40. Oh well. Next time I will be calmer. Today the S&P is down and so are my positions minus CME. Everything looks like it's pausing, so I will be patient. I'm waiting for an entry here. I had a line drawn at $527.35 and it's coming up to that and cannot seem to move past it. I do not want to be buying my Sep540C at $12+ or on the move up, rather on a pullback. What looks to be a good place for it to pullback to is the 20 EMA as well as around $521.25. At that, the option should be around $8.50-$10, which is more reasonable for me. I would only be getting in one contract. It's now crossed below the 20 EMA and heading towards $521.25 at 2 hrs 40 min. in the market. We'll see. I'll be patient. It should settle around here and then I will put a contingent order to get in around $522 as it moves back on up. However, it's nearly lunchtime on the east coast, in about 15 min., so we'll see how much action there is. If there is a certain stock anyone would like me to look at, feel free to make a comment and let me know. Or, if you're in a position and just wanted to know what I see, I'll give you my unbiased thoughts on what I'll see and provide charts. Note, I use an arithmetic scale. Over the weekend, I looked at the stocks I trade in the log scale and it just didn't work real well with me. Today I just received Tim's book and will look through it. It's 400+ pages and I'm notorious for not reading books totally, so I will skim and do selective reading and see how he charts on a log scale. I'm nearly finished with the organization of my paperwork after 3 full days now. I have maybe a couple more hours to go. Then, I need to begin looking for the things the IRS and accountant want. Hopefully I can get this all done in the next 4-5 days. Let the accountant do his magic, so as long as I provide him with the correct and right information. Well, time to put my kids to bed. $SPX: The targets for these would be the most latest failed rallies on the way down. These points are: 1525, 1545, 1556. What will the market do? I have no clue. It's had 6 trading days in the 1488 to 1453 range, over a week. 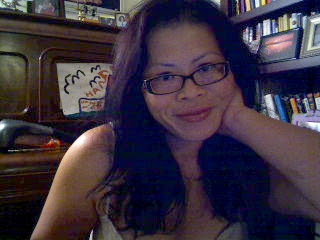 One day, 3 days ago as an exasperation attempt. Even were it dropped to was not a surprise, as it was a failed attempt on the way up to reverse direction at 1433. Two days ago when it was so bullish, it dipped lower to flush out any short sellers and began the bargain hunters buying spree. Today, I've put a contingent order for RIMM for Aug230C if it exceeds $227.60. This takes out all the tops, but there are couple wicks that are a little above this. A better entry probably would've been at $224.85. The FOMC today came out with their report that they weren't going to raise interest rates, amidst concerns of inflation. My chart is set for my time zone (Mountain - AZ), so the FOMC took place at 11:15 am. Shortly thereafter, you see like a sigh of relief as the market dropped a little. But, the market rose in anticipation of unchanging interest rates that have held on for now over a year (Jun'06). After initial 15-20 min. of digesting the news, I believe just waiting for the wording to come out, stocks did drop, but after the release of the news, for the next hr it being good, stocks started to rise again. But, they settled into a comfortable zone. Note today's high is coincidentally the support where it's come down 3 times before in the uptrend. Think that's coincidence? BTW, other than putting lines for the double-triple bottoms and annotating those, all the other lines on all the graphs in this entry were already drawn. A part of good charting is knowing how to read the chart. It always amazes me when things come to sit on or bump up against the lines I draw. I really say that in all humility because it seems almost magical to me. Ryan has really taught me well and it never ceases to have me in awe as to how manipulated prices are. On the line chart of the $SPX, we can see we have a triple bottom. Today's close is slightly above the mid-points of the last 2 "highs". This triple bottom is still good, but there are 2 other triple bottoms that are better than this one. The one that is the next good one has all its bottoms level. The best triple bottom is when the bottoms are sloped upward. In the case we have here, they are sloped downward. Since the confirmation signal of a reversal comes after the mid-points are broken and we have that, this further says where we were was a good support. How much of a bullish play will this be? I have no clue. It could go up to the 1485 (not far), 1522, 1560. This is based off this line chart. 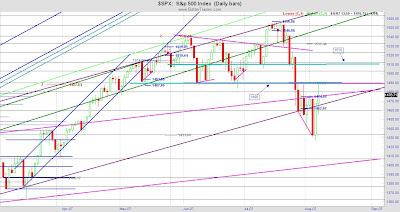 However, in the candlestick view, 1490 is a support in the upward trend which it had 3 rotations. For 1510 support, it had 2 rotations. So, these would seem like they would be likely areas for resistance. Time will tell if what I'm seeing is correct or not. I apologize for the messiness of this last chart. This is the chart I mainly work off that I'm always marking up. Today I closed out on my bullish RIMM position for a small profit, as my trailing stop got triggered. I did not re-enter another position and will wait until it crosses over $226 strongly before entering another bullish entry. Sometimes RIMM gets into these compression patterns that last for 2-3 weeks and one can get whipsawed. Though, I am thankful in the past 2-3 weeks I've been able to take profits from RIMM during this time. 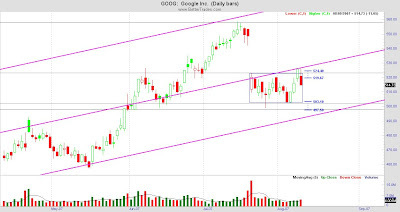 If it gets closer to the top of the rectangular pattern and begins to head down, I may take a position because $226 to $214 is still a $12 move in the stock, and getting an Aug230P would probably cost $8-9 at $225 and in 2 days to move down to $215 would make the option about $16, losing some time value. $7-8, however, is nothing to scoff at. I'll take it. This week the only economic report worth mentioning is the FOMC. The rest, as Ryan would deem, are C/D rated items. If I know Ryan well enough, he'd probably say that in a week where there is not a lot of news, we get raw sentiment of the traders, how they really feel about the market without anything significant driving the market. The basic jist of the FOMC from what I can tell is that nothing much has changed, so the market breaths a sigh of relief. Good, we can get on with business. How does the market feel? Bullish. Yes, not something Tim likes to hear. The swings in the market are highly volatile and have been making big swings. I haven't been taken out of my positions yet and ended up getting back into to AAPL when it bounced off intraday support of $133ish. Set a contigent entry for $135 for Aug135C - 2. Small position and I expect to be out sometime this week. Not paying a whole lot in time value for ATM. The market is certainly interesting. Watched a little this morning, but had mommy duty to do and more organizing of things. One thing I am learning since I see a pattern here with myself is to keep things as simple as possible. No need to have lots and lots of accounts, unless you have someone managing them and an accountant to help you. As I'm looking at all the various accounts we have, it really is very incredible that we opened so many of them. One of the things I'm learning is the words I use to myself are very powerful, so I will pay special attention to watch my language, as I do not want to be instilling or reinforcing negative mindsets in myself. Stops are a part of managing risk, as well as the size of your trades. Just because you have a big trading account, that does not mean you're to take big positions. If you do not have the knowledge, skill, risk management, and discipline, it's best to NOT trade with any real funds until you get that. - $1 Trailing Stop on the stock at $586, just in case it decides to try for $600. Yes, this is a bit far away from $600, but the market has had some big moves. The last time I set a trailing stop on a call position at $592 and it didn't go quite there to reach it, so, this is a just in case. This is $12 from where it closed today, so if in the morning it decides to just reach up in that area and pullback, I'll be out of the position. - It did break the downward trend it was in 3 days ago, however, the last 2 days have been overall bearish. -The past 2 days have been sideways. 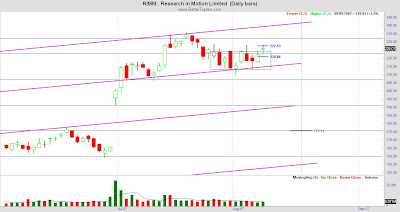 - RIMM often gets in these rectangular consolidation patterns, and sometimes they can last for 3 weeks. - Just looking at only the price chart, it seems a stop in the $213-215 range would be good. - If the stock closes below the 20 EMA, this would be reason enough to get out. This would be at a slight cost to me as I got in about $216. This confirms what I'm seeing on the price chart. - MACD/RSI look to be turning from oversold to possibly finding a support here, but it hasn't quite made that turn yet. - Momentum indicators show slowing down, and perhaps an indecision period. No point in getting stuck here and watching time value go against me. - $0.75 Trailing Stop at $221. - Here's a situation where I set a bracket and got triggered for the upside. Apparently when I got triggered, that was near the high and the stock came tumbling down not too long after that. - Had an alert last Friday set for $56 to get stopped out and was doing okay with the position, though it was getting close, until the last 2 hrs of the market, where it dipped below. Waited patiently, without hoping. - Today, I did not have an actual stop placed (breaking a rule of mine) and wanted to see how the market was going to respond. IF it was going to further tank, I was getting out. IF it decided to rebound, then I would keep my position. 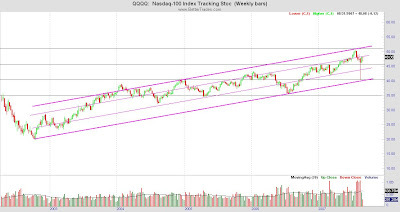 - There were 2 trend supports and these were right near the area, so I wanted to give it room to work. - My other technical indicators showed it was possibly reaching a oversold, but it hadn't quite yet made the turn. - Today's candle is a hammer, which is about a 45% chance of reversal, not real great. An inverted hammer would have a 70% chance of reversal at support. So, we'll see if we are actually hitting a support or just pausing momentarily. 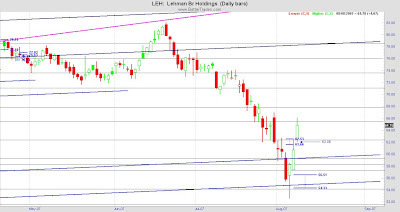 - LEH often trades with the market, but it started on it's bearish move a few weeks early and then the market decided to join in also. - Stop @ $56.25, just below today's open. I had done a balloon strangle on AAPL and BIDU with very small positions. I closed out on the AAPL puts with a profit, but I am negative on the AAPL calls right now (because it was so way OTM). All of these I calculated and knew if it did not move huge, these positions would not be profitable. It's the risk I took. Didn't spend a whole lot here, so I will wait until expiration (Aug) to see what it does or get out sooner if it's less negative or with slight profits. Does someone know how to add Excel files to blogger to others may be able to access this? This would be far easier to let you see my Excel file than it is to type all that out and place here. In case you're wondering why I might be in a trading blog sharing with you about organizing, paperwork, my family, my marriage, etc. is not because I'm talkative or like to write, but all these aspects of my life DO impact my trading. There are books, DVDs, courses, etc. up the gazoo on what how to gain knowledge, but I find fewer things helping you develop your skill, and even fewer to help you actually set yourself up for success in terms of what are the things that might impede your success. Let's say you want to be a profitable trader, but you cannot balance your checkbook, do you think there might be a disconnect here? Or, you're a highly emotional person, and you just can't figure out how to trade unemotionally? Do you think that if you're going through turmoil in your life, you might have to take a different approach to trading? What if you were so disorganized, you forgot you had positions on the table? Think that might be detrimental? What if in your subconscious buried deep inside you you do not feel you deserve wealth or to be prosper? Do you think that no matter how skilled you are, how much knowledge you have, that that might impede your success? None of these things are uncommon to me. As one who is a problem solver, I'm always looking for the root cause of problems. Often times what is obvious is not truly the answer. My life has come with a lot of baggage, but I've been able to get rid of a lot to get to where I am. Still, there is a long journey ahead and more things to deal with. For me, this not a vent blog, rather sharing in my journey of how to be a good trader. I do make good trades and am a profitable trader, but that's not enough. I want to be a phenomenal trader who achieves her dreams, the vision for her life, empower my family & others. Can you taste that? As a side note, my favorite game as a child was "Pit". Any of you heard of the card game? It really didn't dawn until me this year that I was born to trade. Maybe I'm not the superstar like some of the men I've read in Market Wizards, but in the world I live in, there are many I can impact. I did make money on AAPL and was going to take profits on CME and RIMM also today, but my criteria wasn't met, so I'm still in those positions. Am also in BIDU and LEH. Don't have time to go into details there, but I spent most of the morning on the phone, getting necessary things straightened out (and there is a lot). If organizing is a trait of yours and you love to be this way, that's fantastic. As a person that loves to experiment, deal in theory and loves to look at the big picture, more creative (yes, a former engineer is creative), administration or micro-managing (as I so see it) is not my cup of tea. However, oddly enough, I do love the details of actually trading, which deals in charts. Perhaps it's the visual thing of charting that I love so much. If it was just all numbers without patterns & pictures, I'm not sure if I would love trading. Early in life, I started playing the piano (at age 4) and music has always been a love of mind. In my head, I hear and see patterns of things. Music & trading are both very artistic. Okay, back to reality. On the phone sorting through things was not fun, but much of this afternoon, when I wasn't doing mom duty, has been spent going through paperwork, lots and lots of paperwork. Would you like a picture? Probably not going to provide this, as I don't really feel like taking one, though, for the sake of progress, this might be a good idea. The thing here is to get things down to specific accounts chronologically ordered so I can se where I am. My husband who has since moved out, has decided he has no responsibility in any of this, though it was his job through the past 4 yrs to maintain and organize our paperwork, as he worked from home. Now having spent weeks and now there is this sense of urgency to do this, I have decided that this all needs to be done with our without his help financially, legally or otherwise. Yes, not a good situation to be in, but instead of having some pity party, gotta rise up and take the bull by the horns (or give a big bear hug). No puns intended. LOL. Rather than procrastinate, this week I will get ALL my financial paperwork in order, get all my stuff to the accountant to help me, and setup a system that I can manage and live with that will ensure that I can be successful. I must assess where I am before I know where I can go. God can't deliver to chaos. One of the aspects of success, from what I can tell, is the areas I am successful in, I am highly organized in those areas. Earlier this summer, I went through and decluttered, organized most of my home, going through each cabinet, closet, over things, under things, getting rid of things that no longer served a purpose, and really creating much more empty space in my home. Things are now visually organized and aesthetically pleasing. AND, daily I maintain this organization in my home with my kids, enlisting for their participation. This has drawn and given me much better relationship with them and more peace overall in our household (inspite of the turmoil in my marriage). Earlier this year, I had greatly gone through a lot of paperwork and sent bags and bags to be shredded to the shredders. Though there is still a lot of paperwork that I'm working on now, it's a different aspect than what I was working on before. What I noticed in each of those timeframes, my trading got better as I "organized" for success and decluttered, getting rid of things that are no longer necessary. Maybe psychologically there is a freeing up, such as the Law of Vacuum. Nature abhors a vacuum. Which has allowed me so much more to receive from the market. This isn't the most pleasant part of trading, but needs to be done. Being that my husband managed a good portion of our finances and many accounts while I worked, as well as the paperwork, but was not organized or really managed it, I am now needing to get all this stuff organized and see what needs to be done. It's really not pleasant at all and every turn it doesn't look good. However, I have been a part of this marriage and rather than shift the blame to him, I should've been more participative and interactive, even if I was working a lot. Administration has not been my gift, but whether it is or not, it needs to be done. So, I'm needing to get my tax situation well under control, which it isn't, as well as many other things. Things do seem rather daunting, but I'm tackling each pile and working to manage my kids and household at the same time. Let's just say this isn't the most ideal situation to be trading. IF I knew then what I know now, I'm not so sure. It is fairly stressful. I did create an Excel spreadsheet of the bracket trades which I will append, if I can figure out how to do it. But, most of today will be working on taxes and money management, organizing for success!!! I spent the past 2 hrs getting the brackets setup and typing them in and blogger is messing up what I'm doing, so I'm going to have to figure out a different way to provide the brackets. Maybe I'll do an Excel spreadsheet and attach it. Not sure how to do that. Will have to figure that out. Excel would be far easier to do than typing it all out here. Gotta go to bed. So tired. Night all. I'm by far not the psychological guru or can even say one bit that I truly know anything here, but I can share with you my experience. I'll leave that psycho therapy stuff to the Van Thorpes, Douglases, Elders, etc. 2007 as I looked at it from 2006, looked to be a great year of promise and hope for a new life not only for me, but for my husband and I, and our 2 children. I had worked really hard to build up my trading, get the education, do the practice, get the knowledge, discipline, consistency, develop good risk management, and the list goes on. Working full time at my mechanical engineering job, traveling for trading, doing all those practice and funded trading, building my accounts (again), managing my family & marriage, health, fitness and the volunteer work I did, was a huge undertaking. Though I was not quite ready to give up my day job, as I got paid really well with great benefits, I felt God leading me to leave engineering. In all reality, this seemed pretty nuts. I wanted to build up my trading accounts to 9 digit figure before leaving and I was nowhere near that. But, God made it unequivocably clear that He wanted me to leave engineering. So, I gave 3 months notice and then I was out of there, starting 2007 as a full-time trader. With my husband's blessing, though I felt a bit nervous, he said he was supportive of my decision to leave engineering. Little did I know he did not tell me the everything he needed to. But, it was God I was being obedient to. For those of you who do not believe in God or anything, this whole thing will sound wreckless and stupid. Okay, so be it. Thought I would be able to hit the ground running after leaving my job, but there is a psychological aspect of totally switching careers that I was not equipped to handle immediately. Having had some costly lessons trading when super stressed out or physically ill, I decided to take a couple months off. During this time, I enjoyed my family, though, things seemed odd in my marriage. I worked to begin working on organizing some of the paperwork that my husband did not do over the past 4 yrs that he stayed at home. This took nearly a month to get about 2/3rds done. Before I could continue on, things started to unravel in my marriage. This was about the time I started to get back into trading with small funded trades. Well, needless to say, which I will not spell out in this blog, what I thought about my marriage & husband, were totally incorrect. Someone forgot to clue me in on things. As a result, the next 4-5 months were sheer hell. The lives of my children and I have been turned upside down in a horrible way. My heart had longed to be with my children since each were born, but because I was the major breadwinner and we lived on my income, that wasn't possible. Thus, that's why I worked so hard to make this trading thing work. To put in 100+ hrs a week at 2 full time jobs was not easy. I slept very little and was so disciplined. I have loved my husband and poured my heart into him, allowing him to spend the last 4 yrs building our video production business. My disappointment and grief were great. I was devestated. My children have also been having a very emotional time with all this and it's a rollercoaster. I've not been used to having my children around so much, and now they are around all the time, demanding constant attention. Because of the instability of my marriage and our family, this has also placed extra demands on me. Not only do I have to deal with my stuff, but also with my children's and the aftermath of the wake my husband leaves behind. He's left me with a financial mess, which I'm working to sort through. I've reorganized the house, getting rid of things that would clutter it up, not allowing me to have room and space to think. Administrative work is not something that is a talent of mine, but I'm learning to do this. These are challenging times for me, the most I've ever had in my life. My children depend on me and I will not let them down. The hopes and dreams that they have, I will role-model for them what a strong, godly woman I am. My trading accounts now are not big as they once were. It is imperative that I have great risk management discipline, but not be afraid to trade. There are many fears I've had to overcome over the years. I started addressing them in May'01 through to today. From Aug'05 to Mar'07, I used an energy psychologist on a weekly basis to help me get rid of psychological issues dealing with money, career, relationships, etc. Great progress was made. Though things between my husband and I are not good, they are at least civil. The burden of our children, home, businesses, finances, taxes, everything rests on me. He is doing what he wants without much regard for our children or myself. I never dreamed I would be this burdened in my trading or be in a position such as the one I am in. However, inspite of all this, I do have great discipline in my trading. If I am very emotional, I will not trade. I do so many practice trades, that most of the time, I cannot tell which trades are real or funded, until I check my accounts. At that point, I pull out my Bracket Trading sheets and look to see what decisions I made on them and enter my orders. All orders are contingent. The best decisions I make in trading are as if no pressure exists. Though my life situation is very emotional, as far as trading is concerned, though I need to be making money, when I'm trading, I do not think about the money I need to be making, rather I focus on good trading. Good trading will lead to profitability. Focusing on the money will cause you to literally lose it. When I have a cost, I do not become emotional about it. Well, I need to spend the next couple hrs doing some money management and spend time with my kids. Not sure if I will have trades ready yet for tomorrow in my blog. We'll see about my time.